For the 7th consecutive year, Honda Motorcycle & Scooter India Pvt. 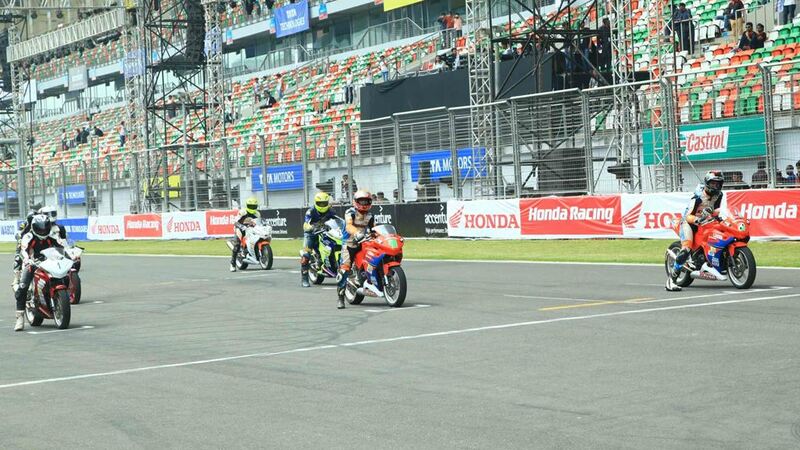 Ltd. (HMSI), the only Honda in India conducted Round-1 of One Make Race at Buddh International Circuit (BIC) Noida, from 21st- 23rd March, 2014. Popularly known as the ‘Honda One Make Race, the three day long racing event witnessed some exciting action which saw professional bikers across the country battling for glory in different categories. Honda has been synonymous with racing and passion of motorcycling worldwide. Through the highly popular ‘Honda One Make Race’ the company continues to provide ‘Fun Riding Experience’ to all participants as well as spectators in a safe and controlled environment. Bringing intense excitement and adrenaline to the race, the CBR 250R category was under Team Championship. CBR 250R performance bikes were leased to teams registered at FMSCI. These vehicles were modified with imported HRC performance kits for an exhilarating output. Honda further supported participating teams with Original Spare parts worth Rs. 10,000 and set of tyres replacement each round. This year, Honda introduced it’s CBR 150R Novice category at BIC to promote racing amongst new riders. 10 expert riders from 3 teams competed in the Team Championship for CBR 250R race. A total of 18 riders participated in the CBR 150R Novice Category including 2 wild card entries. Participants were judged in their respective categories, of which Top 3 racers were awarded attractive cash prizes (1st — Rs. 7500, 2nd — Rs. 5000, 3rd — Rs. 2500).